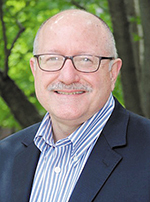 Board-certified psychiatrist W. Scott West, MD, DFAPA, has treated patients with mood disorders throughout his more than 30 years in practice. For patients with refractory depression, it's far too easy to fall into a vicious cycle where the condition is exacerbated by the despair that accompanies yet another failed treatment. As medical director of Nashville-based ThriveLogic TMS + NeuroHealth, West gives patients with treatment-resistant depression another viable option in addition to medication and psychotherapy to improve their condition and quality of life. Just over eight year ago, he brought the NeuroStar TMS Therapy® system to Nashville, becoming the first physician in Tennessee to utilize transcranial magnetic stimulation (TMS) to improve symptoms of depression in patients where other options have failed. "It becomes another tool in our toolbox that we are finding to be very effective and well tolerated," he said. "Transcranial magnetic stimulation is an outgrowth of MRI technology," West continued. While researchers knew magnetic stimulation had a definite effect on the body, West said the question was what might happen if specific parts of the body were stimulated? In the mid-1980s, pioneering work by U.K. researcher Anthony Parker, PhD, led to the development of TMS. West said additional research by Barker and Mark George, MD, demonstrated magnetic stimulation to specific parts of the brain led to positive changes in mood regulation. TMS ... or rTMS for repetitive transcranial magnetic stimulation ... received FDA clearance in 2008. "The FDA indication is that TMS is effective in treating major depressive disorder in adult patients who have failed to achieve satisfactory improvement from prior antidepressant medication in the current episode," West said. He added TMS delivers a magnetic pulse to stimulate the prefrontal cortex over a series of in-office, non-invasive treatments. West, a Diplomate of The American Board of Psychiatry and Neurology, first learned of the technology in the early 1990s and continued to follow the progress as researchers refined the treatment protocol. "I made the assumption this is something that would land in the academic sphere," he said after the therapy gained FDA clearance. "As it turned out, that wasn't necessarily the case." Ultimately, he reached out to the NeuroStar developers to learn more about personally bringing the system to Nashville. "I have enough people who aren't quite well or aren't getting well with standard treatment so we need new treatment options," West said of being open to adding other evidence-based options. "Depression is a very nasty illness. Too many people have major depressive disorder," he said, adding the condition impacts 6 to 9 percent of the U.S. population at any given time and that about one-third to one-half of those patients don't achieve the desired outcomes. Not only do those patients fail to thrive, West said the depression impacts just about every aspect of their lives from work to personal relationships. 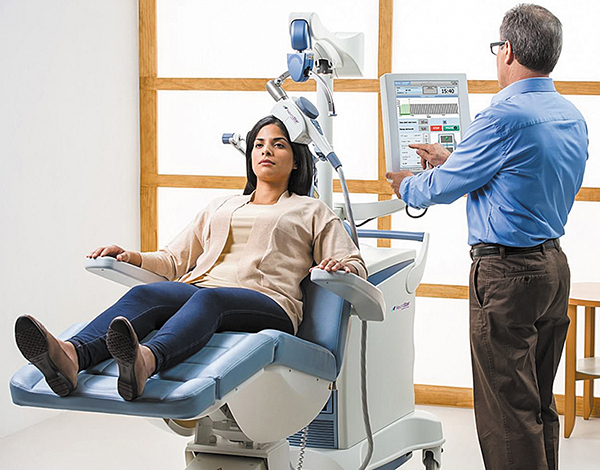 "Traditionally, outside of drug therapy and psychotherapy, we had electroconvulsive therapy (ECT) and vagal nerve simulation (VNS)," West said of the most common options prior to TMS. Both, he continued, have drawbacks for patients. "ECT is the shock treatment that's been around for 75 years. It's much better now but still requires anesthesia so you couldn't drive yourself," he said of going for treatment. "With ECT, we see about a 60-80 percent response - it depends on the study you look at - and at about six months, people are showing a decline with return of symptoms." VNS, he continued, is more akin to deep brain stimulation. "It's a surgical procedure and has about an 18 percent response rate and takes about six months to achieve response," he said. With TMS, there's no sedation so patients are able to drive themselves to an appointment. "You can leave a treatment and go to school, to work, to the gym, to the store, and do anything you want," West noted. "The most common side effect is discomfort at the site of stimulation," he added, noting some patients also report headaches that are treated with over-the-counter pain relievers. "One side effect of more concern is seizure activity, but TMS does not cause seizure disorder. The instance of seizure activity is 0.1 percent over the entire course of the TMS procedure," he noted. "ECT is a generalized stimulation with the intent to cause a seizure. TMS is a focal stimulation of a specific part of the brain ... that's a big difference between the two," West continued. Although each treatment is TMS short, the therapy does require a time commitment. "The protocol we generally us is 30 treatments over six weeks, Monday through Friday, 3,000 pulses per treatment." In his practice, he said people generally begin responding after about 20 treatments. "Oftentimes, family sees subtle changes first. Typically, people start being more positive and animated," he noted. West has been pleased with the results. "The initial studies that looked at people in the research realm took people off of all medications, had a washout period and no psychotherapy. In those studies, we had response rates of about 55 percent." He added that in a real-world application, patients could use TMS in combination with other therapies. NeuroStar, he continued, has started a registry with de-identified information to track patient response. "There are about 1,500 people in the national registry at this point, and 62 percent of people are responding to TMS," he said of the most recent data available. West added this number takes on greater significance in light of the fact that patients utilizing TMS have not responded, on average, to 2.8 courses of antidepressant medications. Statistics, however, can't compare to patient experience. "After treatment, one person said it was the first time in 20 years she had felt joy," West recalled. "To us, that's really powerful."